Listening to a promotional lecture on a recently launched nutrition supplement, I wondered how many normal persons would begin to take them and how many of those people really need them. A body-builder's comment in a health programme last week on TV informed the viewers that one does not get adequate proteins by eating food and therefore one requires supplements! Misguided information about supplements is leading more people who need less or no supplements to take them. The irony in our country is that those who really need supplements are the hungry or undernourished people who cannot afford to buy them. On the other hand, those who can afford to buy supplements and do take them regularly, do not really need them because they can get adequate nutrients from natural food if they balance their food intake well. Supplements are best utilised by patients in a clinical set-up when properly prescribed by the dietitian. Three months ago, an article, published in the British Medical Journal, stated that Americans can easily buy 12 dangerous dietary supplements over the counter or over the Internet. At least five of these supplements are banned in Asia, Europe or Canada. Imported supplements have arrived in plenty in India. The general public is not aware if these supplements are subject to safety checks or not. Sometimes, the accompanying literature is not based on research, nor is the product time-tested. 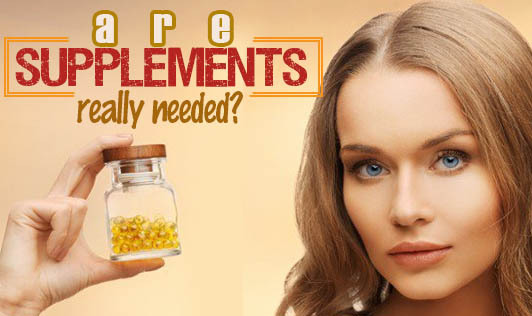 Only testimonials that cannot be proven true or false come along with the supplements. Most of these supplements are available through network marketing and not directly from the shop. Those who sell / promote these supplements claim that the product helps to prevent a disease or disorder, or promote healthy function. Though many have long lists of ingredients and nutritional values printed on the labels, most consumers either do not read or don't understand the terms. Some studies show that a nutrient in excess can actually cause harm. The bottom line is that nothing can replace the goodness of natural foods and their nutrients. So, the next time a supplement is pushed into your face, think before you buy it or ask for professional advice from a qualified nutritionist.